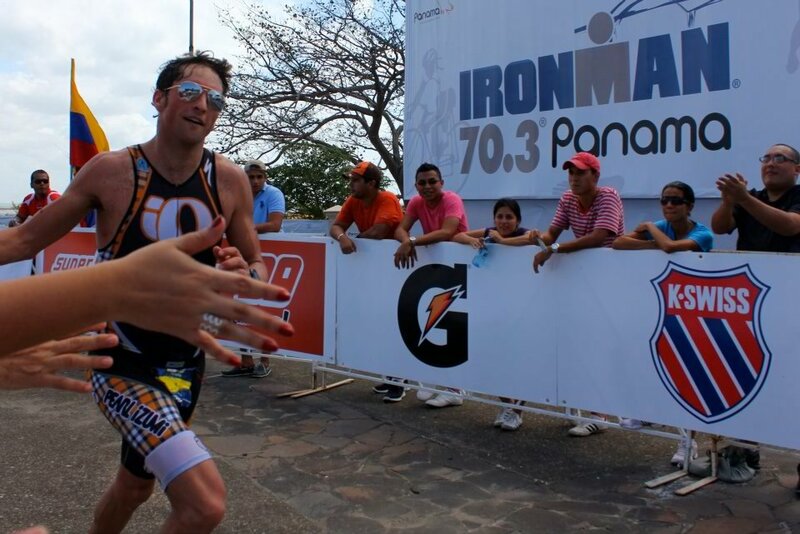 Hello raving starving crazy mad lunatic fans, the first race of 2012 is in the books – Panama 70.3! Check out below for the full recap, and of course, let me know what you think via my newsletter, comments, twitter, or facebook! Press play for the soundtrack to this race report. Yes, I had this song in my head the whole weekend. And yes, it’s because it was on Glee last week. For the first time in hot and humid conditions, I avoided Crampy McCramperstein and didn’t completely die. Booyah! I had an improved bike despite riding solo for the majority of the race. I had a decent swim – on par with most of last year. I still got dropped from the front swim group, which probably cost me a couple minutes on the bike by isolating me out there. I faded quite a bit in the last few miles of the run. I finished 6th in a solid field. 2nd American behind this guy named Lance who used to race bikes :). I’m really happy with this result, it’s a great kick-off to the season! First shave of the season, thank god for TP and electrical tape. 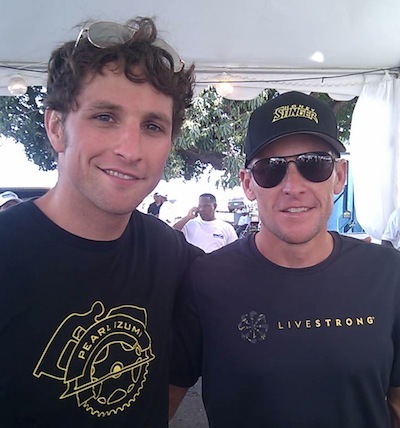 So maybe a week before the race, Lance Armstrong, – yes, him, really – announced he would make his half ironman debut in Panama. Holy crap. My first race of the year had just gone from intentionally under the radar to the most anticipated event since season two of Desperate Housewives. In all honesty, I did my best to avoid the buzz before the race. It was super cool/exciting that he was racing, but it was really important that I not get too distracted. I had to make sure that I did what I spent a lot of money to come here to do – get as many 70.3 Worlds qualifying points as possible. So I spent most of my time in my hotel room, getting ready, eating the same dinner from room-service 3 nights in a row (if you know it doesn’t make you sick, don’t change it, slick! ), and, of course, shaving my legs. Despite some awesome matching cuts on my achilles, I felt fairly relaxed and ready to race come Sunday. 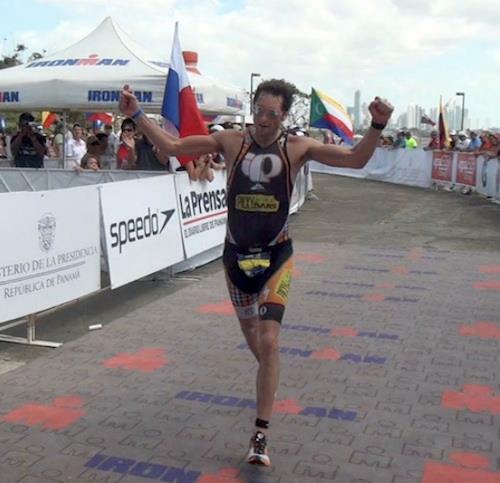 The first pro in transition, Nerd Alert!. Apparently I’m also possessed by a demon, Demon Alert! I lined up next to Chris (Lieto) because I’d swam with him before at Vineman, and hoped to stay with him again. After the washing-machine first 400 meters, I got on someone’s feet and swam like hell. When I sighted, I saw the guy had a yellow cap, and I immediately though to myself, “Oh my god, I think I just tickled Lance Armstrong’s feet!” Just kidding. I actually thought “Hot damn these guys are going impossibly fast.” And…I was right. About 700 meters in I got dropped, and swam the rest of the way behind one other dude. The first part of the course was AMAZING. Hilly and rolling through pretty lush forests. Yes, I said pretty, like a beautiful rainbow and butterflies. I was actually enjoying riding my new bike in la-la land despite crushing my legs trying to catch the group. At the first turnaround, I wasn’t catching the group, so I settled into a more sustainable/mellow pace. At the next turn around, I saw that I had lost another 2 minutes, ~3.5 minutes out of 8-10th place. If I didn’t start cranking, there was no way 8th place (my goal) was within reach. So I HAMMERED for the next 20 miles and started picking off some guys. At the final turn around, I had gained 45 seconds on the group. When I got into transition, the announcer said, here comes Jesse Thomas, he’s in 9th place, 3 minutes out of 8th. He also said nice shades. Sweet! I’ve discovered that I can always tell, in the first mile, whether or not I’m going to have a great, average, or craptastic run. Let’s call it my Rundar (run + radar, Nerd Alert!). With the oven-like heat, my Rundar was hovering between low decent and solid craptastic. So I went into Survival Mode. I tried not to think about who was in front of me, what the gaps were, etc. If I caught people, great, but first and foremost I needed to finish or no 70.3 points. So I just ran off feel, concentrating on my nutrition plan. When all else fails, Survival-Bieber Mode is your best bet. Luckily for me, other guys were struggling in the heat as well, and they started cracking. I passed #8 about 4 miles in, #7 at mile 6. At mile 9 I started hurting pretty bad so I stepped it up to Survival-Beiber Mode and used the energy of the crowd to keep me going – giving High-Fives to anyone that wanted them, saying thanks when people said nice aviators, you know what I’m talking about. I passed Chris just after mile 11. I, of course, pretended like I was feeling great, and Chris just about gave me a heart attack by matching pace for about a mile. I was in NO mood for a sprint to the finish line. Luckily he wasn’t either, so I eventually had a safe distance to cruise in. I came in, zipped up my totally awesome new jersey and I crossed the finish line trying not to look like an aviator-wearing-sun-crusted-zombie. I was unsuccessful. Survival-Bieber Mode engaged. (Thanks Stephanie Fleming for the photo). I finished 6th place, 2nd American behind Lance. I faded a bit on the run, maybe could have finished 5th, but there’s always the shoulda, coulda, woulda. And, my fade wasn’t nearly as bad as other hot races like my Boise zombie crawl, or the biggest winner, my Philippines death march. The fact that I didn’t cramp, rode well, and finished strong is a good sign of things to come. Plus, I got 70.3 points, booyah. It was pretty cool to have Lance in the race, and I let myself enjoy it more after it was over. He drew a TON of unexpected attention, and obviously raised the level of the field with his finish. No Lance, I like YOUR glasses. After the race, a guy who had been talking with Lance introduced himself to me. He said he saw me out on the course and really liked my aviators and style. I told him thanks, that the glasses had, for better and for worse, kind of become my thing. He was a really nice guy and had some cool things to say. Turns out it was John Stapleton, Lance’s agent. At the awards ceremony John grabbed Lance and introduced him to me as Jesse, the kid that was wearing the Aviators. Lance said that John had been telling him about how cool it was that this kid was racing in aviators, etc. We talked for a minute, I told him congrats on a great debut and got a pic with him. Honestly, I don’t get too star-struck, but it was pretty freaking cool that he knew about about the aviators. Pearl Izumi & Ron at the Speed Shop. The Pearl guys, and Ron in particular, absolutely cranked on my jersey to make sure I had something to race in. It was by far the most comfortable, fast, and cool looking kit I’ve ever raced in. I call it Candy-Corn because of the most awesome orange plaid and yellow Picky Bars logo, and because I love Candy Corn. Thanks guys for all the help. Mallory and the guys at Specialized – Mallory pulled off a miracle getting me a fully built bike in like 2 days and setting me up with a BG Fit so I wouldn’t break myself out there cranking on a brand new bike. I’m so pumped to be working with them this year. My split was one of the strongest of my career and as I get more comfortable, I’m confident it’ll get even better. Also, shout out to Eric and Claire at Hutches Bicycles for building it up, and Luke at Collin’s Bike Shop the fit. Really appreciate it guys! Rolf Prima and Cycleops – First off, Katie at Cyclops expedited a new PowerTap G3 hub to Brian and the guys at Rolf, where they hand-built a brand new TDF 60 Wheelset for my race. They did this all in about 4 days. The wheels and power meter worked like magic. If you haven’t seen Rolf’s new TDF 60’s check them out, a super great non-disc option for racing in any conditions. They were solid. Thanks a ton guys! 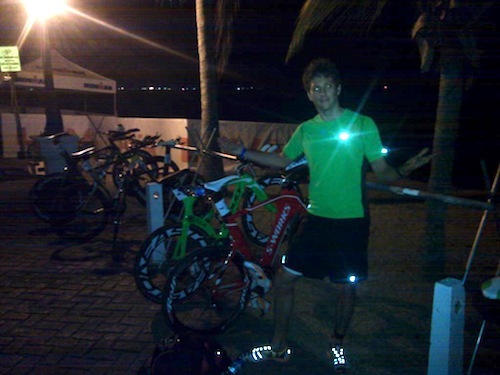 Robert at First Endurance – Robert has been a HUGE help in dialing in my racing and training nutrition. He helped me set up a nutrition plan to combat the heat in this race, and like I said above, it played a huge role in my success. I drank EFS, with tons of water on the bike and Liquid Shot with tons of water on the run. Having his help and products were amazing. I’m going to write a blog in the next few days specifically about my experience with First Endurance, which I’ll go over all the details of how awesome they are. Thanks Robert, really excited to keep it going! Coach Matt Dixon – Great stuff to start the year off Jedi Master. Seriously appreciate it. Matt got me fit and ready for this race, and helped me cool my nerves as the race got more and more hyped. Awesome start to a hopefully solid season! Gerry Rodrigues of Tower 26 – Gerry has continued to help me crawl my way up to the front pack. Not quite there yet, but this was a solid debut, especially considering where I started even last year. Thanks for the tons of time and energy Gerry, totally appreciate it. My wife, my family, my support crew, my newsletter subscribers, twitter and facebook peeps. You guys rock and are the reason that Lance Armstrong now knows I wear aviators. Seriously, I think about your comments, emails, replies, etc, when I’m out there suffering. Thanks a ton you guys for keeping me going.